Here’s to you always, my old candlestick! So said an underground miner in the Similkameen valley back in 1900. This book brings the abandoned mines and ghost towns of southwestern BC back to life as voices from the grave tell their stories in verse. These voices lay silent for decades until Jon Bartlett and Rika Ruebsaat discovered them. Like prospectors panning for gold, Bartlett and Ruebsaat sifted through the fragile pages of old newspapers in the Princeton Archives until they hit “paydirt” in the form of poems about daily life in the Similkameen valley ~ how did it feel to leave the fields and hedgerows of England and come to the BC wilderness? What tools did our early miners use? Why did it take so long for the railway to come to the Similkameen? 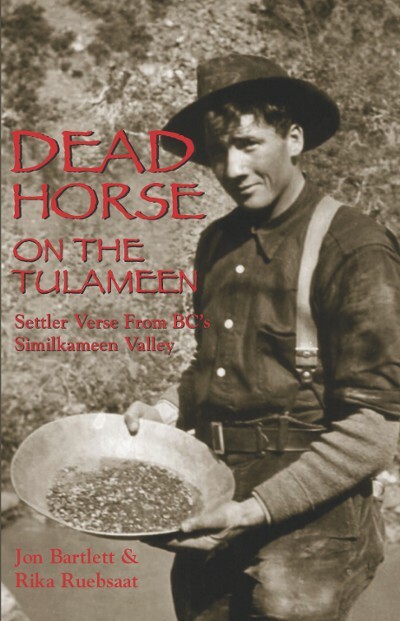 The poems in this book together with extensive archival photographs as well as Bartlett and Ruebsaat’s historical narrative paint a vivid picture of pioneer life in BC’s Similkameen valley. Jon Bartlett and Rika Ruebsaat are singers and cultural historians. Their love of song, their love of the landscape and BC history, and their experiences and skills as historians and educators make them uniquely qualified to produce this book. They have been singing together since 1975, focusing especially on the songs of British Columbia made by settlers, loggers, miners, and fishers. Jon Bartlett and Rika Ruebsaat have produced four CDs of Canadian songs, one of which, Now It’s Called Princeton, features songs and poems from the Similkameen valley.